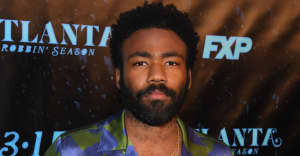 Glover plays Lando Calrissian in the upcoming Solo: A Star Wars Story. Donald Glover, who plays the galactic rogue Lando Calrissian in Solo: A Star Wars Story, is taking fans on a tour of the much-loved ship Millennium Falcon in a new video. The brief clip is above, and it's basically MTV Cribs in space. We see the entertainment area, guest quarters, cockpit, and Lando's cape room. Solo: A Star Wars Story is in theaters May 25. Read The FADER's interview with Alden Ehrenreich, the new Han Solo. Donald Glover will promote the film with an appearance on Saturday Night Live on May 5. He'll both host and perform as the musical guest under his alias Childish Gambino. Check out the newly announced Childish Gambino tour dates with Vince Staples here.